Molitg-les-Bains is a small village and spa located in and above the Gorges de la Castellane in the Pyrénées-Orientales department of Languedoc-Roussillon. France This Way comment: sometimes when we are driving around France we come across somewhere that we didn't know about and did not expect but is very picturesque and a lovely surprise. Molitg-les-Bains was one of those places. Molitg-les-Bains is in two locations, with a thermal station at the foot of the gorge and the village itself on a sunny plateau 600 meters above sea level and surrounded by mountains including the dramatic Mont Canigou. The thermal station is part of the spa chain of 'Chaine Thermale du Soleil' and the spa is beautifully equipped. For a visit you can stay in the 3 star Grand Hotel or the 4 star Chateau de Riell. The Grand Hotel has direct access to the spa and the Chateau de Riell, an attractive Baroque folie, sits above the spa. Both are in lovely peaceful locations perfect for enjoying a spa break. 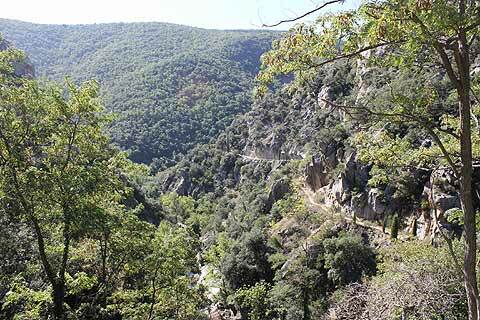 Along the edge of the river in the bottom of the gorge there is an attractive walk leading to the thermes. Also interesting is the little Chapelle des Bains built in neo-gothic style in the mid 19th century. This was built because visitors to the spa found the long climb to the village church too much. The Chapelle is set in attractive gardens. The village above the spa is small and dominated by its church and attached chateau of Molitg. The castle, known as 'Le Casteil', has now been converted into holiday appartments for visitors to the area. The church is an unusal structure as it is attached to the chateau and its bell tower is one of the original castle towers. You can also see the chateau de Riell, built in 1895 in medieval style as this was fashionable at the time. It is now a luxury hotel. A third chateau in Molitg is the fortress de Paracolls which is now in ruins. It can be reached on foot from the thermal park and has great views over Molitg when you get there. 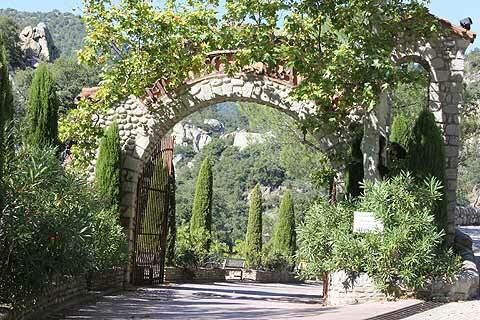 As well as exploring the scenery along the Gorges de la Castellane to the north-west from here, other highlights nearby include the natural amphitheatre at the Orgues of Ille-sur-Tet, east of Molitg and Prades, and the impressive fortified town at Villefranche-de-Conflent, just a few kilometres to the west.